Japanese Sensei Support | Cole Zhu Inc.
How to choose a language for the translation other than the System language? By default, the translation is the same language as the language of your phone. However, if you prefer another language. You can go to the settings to change the language you prefer. We support English, Chinese, Korean and Portuguese. For example, If you prefer to see the Chinese translation of the Japanese words, but you also want to keep your the system language settings as English. 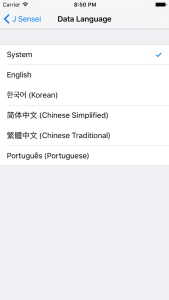 You can go to System settings, in the Advance Section, select Chinese as the Data Language. I am happy you finally updated the Japanese Sensei app, but it still has bugs. Will this ever be updated again? My strong recommendation: please use a true SRS style flashcard system. Some cards are reviewed frequently, but other cards appear once and never come back. This app is so close to being excellent, but there are problems. Hi Dave, Could you suggest how to produce the bugs you mentioned? 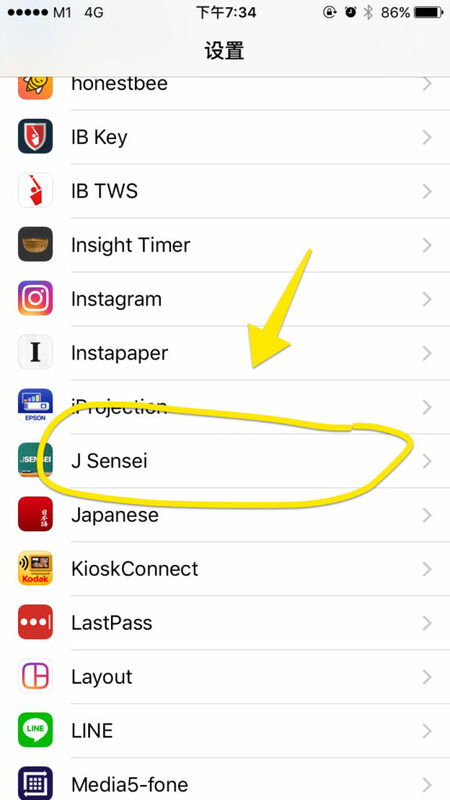 I have been using J Sensei for a few years now. After the most recent update in April 2017, however, I realised that some of the functions were gone. 1. Previously I was able to hold my finger down on the example sentence, and box/list of new vocabs will pop up to allow me to be linked to some of the new vocabs in that example sentence which I would possibly want to learn. 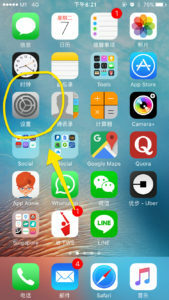 This function, which I think is very useful, is no longer present in the newest version. Instead, I have to go to the search tab so as to search up on the vocab cards of those new vocabs. I hope this function can be brought back in the next update. 2. Inside the search tab, I could no longer search in English, or Chinese Mandarin, if my data language is set to mandarin for that matter. In other words, say if I want to find out how to say “apple” in Japanese, typing the English word Apple inside the search bar will no longer yield any results. 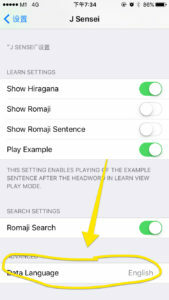 Instead, I have to type the Romaji “Ringo” or the hiragana “りんご” to find “apple”. The lack of this function has greatly undermined the ability of this amazing app to be used as a dictionary at the same time, in addition to a really good vocab learning application. I hope this error could be rectified as well. Thank you Cole and Zhu for your amazing efforts and for making this application the best that it can be. With the few errors rectified, and with the user-friendliness improved, this application will be the best of its kind in the market right now. User of J sensei for about 6 years. PS. I am using iPhone 6 and the most updated iOS as of today. Hi Jacen, thank you so much for your valuable feedback. We will add back these features! Thank you so much for the reply! I really hope to see these features coming back. Also, the feature in my comment below (1 May 2017 1:43pm) about the kanji search, is also very useful for students who wish to learn the many Kun-readings and On-readings of the same kanji and see they could be used differently in different circumstances! Thank you in advance for bringing back this feature also! 3. Similar to point 1 above, I remember I was able to hold down my finger on the top half (the vocabulary part) and the system will lead me to the list of vocabulary using the same kanji but pronounced differently. Please bring this function back as well! Same here, I miss that feature a lot! Also, you guys ever gonna put in a feature for backups? Pain in the arse having to screenshot my fav list every time I get a new device. Cheers. Before this latest version, the Index will show all the words that I have learnt. However, the latest version, The index show nothing after learning a few hundred of words. I use iPhone 6. I have reinstall the App a few times, but same things happen.